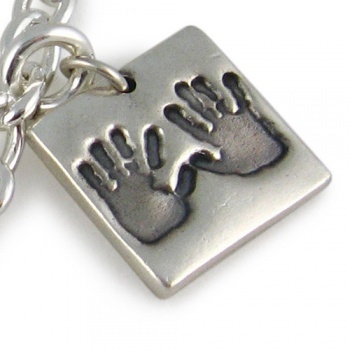 Chunky Bracelet Footprint Charms can have a handprint or footprint(s) with a name or initials depending on the charm shape. 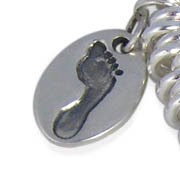 Chunky Bracelet Footprint Charms are about 2mm thick and generally a little bit smaller than a 1p piece. A single handprint or footprint shows the best detail and can have a name or initials written in a choice of 3 writing styles depending on the shape. If the name doesn't fit on the front we can hand engrave it on the back. 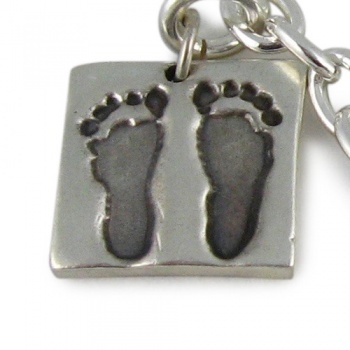 Two footprints can fit onto the square, diamond or heart shape with the name on the back. We will send you your inkless print kit and order personalisation form. You take your prints and complete the order form so we know what names and lettering style that you want. Then simply return it all in the reply paid envelope. 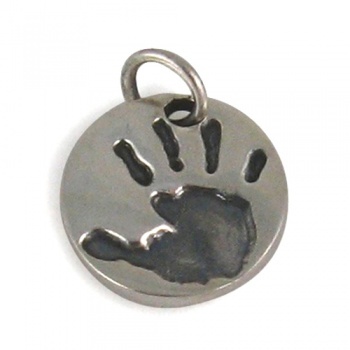 We also do Double-sided Chunky Bracelet Charms with a different hand/footprint on each side.